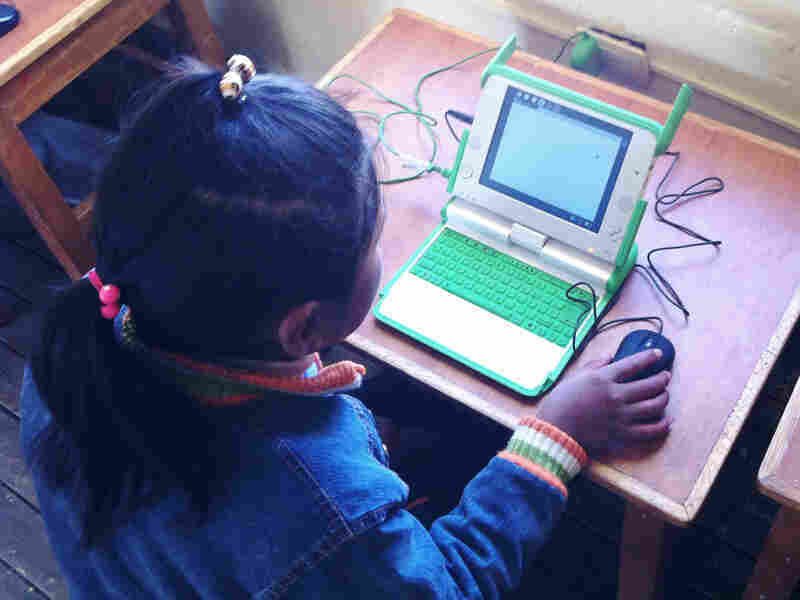 One Child, One Laptop ... And Mixed Results In Peru Five years ago, Peru spent $200 million on 800,000 low-cost laptops that it distributed to children throughout the nation. It was part of an effort reaching around the globe to help pull people out of poverty through computer use. The results in Peru have been less than resounding. Students use a laptop at the Jose Maria public school in a shantytown on the outskirts of Lima, Peru on June 8. 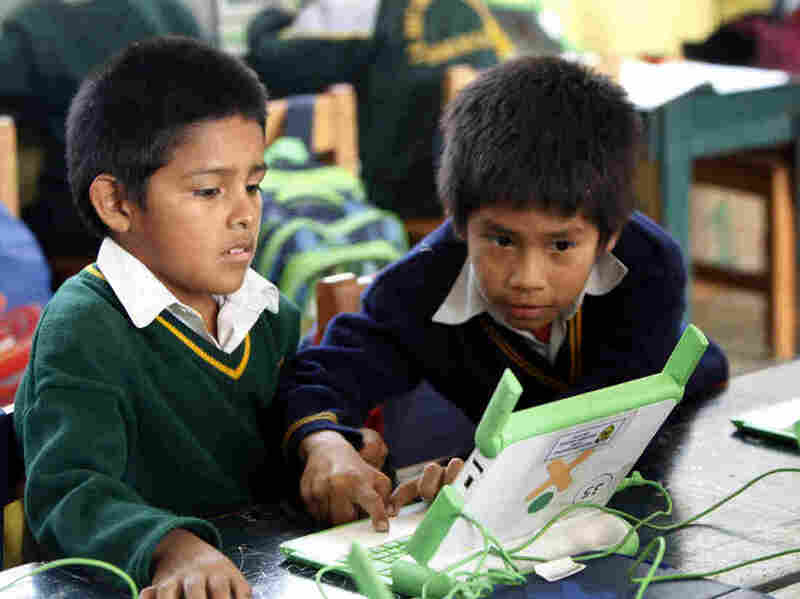 Peru has sent more than 800,000 laptop computers to children across the country, one of the world's most ambitious efforts to leverage digital technology in the fight against poverty. Five years into the program, there are doubts about its success. Five years ago, Peru plunked down $200 million on more than 800,000 low-cost laptops to distribute to schoolchildren. The purchase was part of the global One Laptop Per Child initiative that aimed to end poverty with computers. But now there are a lot of questions about how successful Peru's effort has been, especially in rural areas like the village of Lacachi. Getting to Lacachi means first taking a country bus two hours from the nearest town, away from the shores of Lake Titicaca, then hiking a few miles through cold, windy hills. Lacachi is a cluster of mudbrick homes, pens filled with cows and pigs, dusty footpaths and a small elementary school painted pistachio green. The school has about two-dozen kids. They wear sweatpants or long skirts to class, and sandals made of recycled tires. Each morning they line up outside in front of the mountains to sing the national anthem. In many ways, Lacachi feels lost in time. Electricity arrived just a few years ago, and it goes out a lot. About half of the houses still don't have power. Potable water is supposed to arrive next year. There's no cellphone signal. But because of Peru's efforts to bring technology to schools, all of the kids here have laptops — sort of. A young Peruvian student in the southern village of Lacachi village in southern Peru uses a laptop computer provided through a nationwide program. However, benefits have been limited so far. In some cases, proper software is lacking, Internet access is not available and some teachers have a limited understanding of how to use the computers. Their teacher, Eleazar Pacho, hands out the computers. He walks around asking kids to connect the machines, wiping dirt off their keyboards. But many are broken or need software updates. Several laptops have disappeared. So Pacho often puts the kids in groups on the computers that are still working. Because they can't go online, they use a program to draw shapes. Pacho is young — 28 — and he makes a big effort to stay up to date with technology. He is familiar with the laptops, but he says many Peruvian teachers aren't. "The laptops have become, above all, as much of a challenge for the teachers as the students. A lot of teachers aren't able to use them," Pacho says. And even if a teacher is comfortable with computers, that doesn't fix a lot of issues, like the problem one student ran into about 10 minutes into class. "The screen has a line down the middle, and on one side it's just black. On the other side it's fine, but on one side you can't see anything," the student says. A few years ago, Jeff Patzer, a software engineer in San Francisco, was hired to repair laptops in remote parts of Peru. The biggest challenge, he says, was the lack of Internet. Will Cheap Computer Bridge India's Digital Divide? Because you couldn't go online, everything had to be done in person. Patzer spent most of his time busing and hiking from village to village, often just to reinstall software with a USB drive. "Imagine you have hundreds of these little villages that take two or three days to travel to. I mean, the logistical nightmare of the whole thing is just bonkers," Patzer says. But Oscar Becerra, who used to run the laptop program at the Education Ministry, says it's still an improvement. "If you bring a computer to a kid who's living in the 15th century, you're bringing him to the mid-20th century," Becerra says. About a year ago, Sandro Marcone took over the program. He says there's been some success: A study by the Inter-American Development Bank found Peruvian kids with laptops were six months ahead of their peers in reasoning and verbal ability. But that study also failed to find any improvement in key areas like math and language, classroom instruction and reading habits. Marcone says that's because, until recently, the program didn't actively involve local communities. "The computers are there, and they should get used. I wouldn't have done things the way the last government did," Marcone says. "We need to be more sensitive to the realities of each region, empower local government in those places so that in the future this project is really theirs." Marcone's job now is to come up with a plan to make that happen. He says the government will finish handing out the laptops and that it's also working on better training for teachers, and on getting Internet to more rural schools. Until then, Pacho and other rural teachers are doing the best they can. In Lacachi, that means bringing students to the city once or twice a year, to use the Internet for an hour. Some of the kids in Pacho's class are already planning what they'll do with that hour. Student Roger Aykachicondori says he wants to use Google Earth. "I'd like to find out what the planet Earth is like, see what it looks like," he says. "They say that on the Internet, you can see the whole planet."